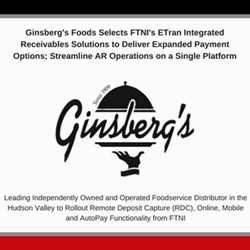 Financial Transmission Network Inc. (FTNI), a provider of industry-leading integrated receivables solutions, today announced Ginsberg’s Foods, one of the largest independently owned and operated foodservice distributors in the Hudson Valley, has selected its ETran Integrated Receivables platform to deliver advanced Remote Deposit Capture (RDC), Fully-Hosted Online Payment Portal, AutoPay, and Mobile Payment solutions across its accounts receivables (AR) operations. FTNI’s ETran platform will power Ginsberg’s new suite of payment services which will provide expanded online and autopay payment options for Ginsberg’s customers, and mobile remote deposit capture (mRDC) technology for Ginsberg’s sales reps and drivers to securely accelerate the acceptance, invoice matching, and deposit of customer check remittances received in the field. FTNI and Ginsberg’s are on target to rollout the first phase of these services early in Q1 2018. Ginsberg’s Foods has grown into one of the largest independently owned and operated foodservice distributors in the Hudson Valley since its humble beginnings as the local grocery store and butcher shop in Hudson, NY in 1909. Ginsberg’s has been a proud member of UniPro Foodservice for nearly 30 years. UniPro Foodservice is the largest foodservice distribution cooperative in the United States, with 400+ distributor members and over 800 distribution locations. FTNI’s momentum as a top provider of truly integrated receivables processing solutions to the foodservice and beverage distribution industries continues to accelerate, adding 15+ new food and beverage distribution customers in the last 12 months. ETran has been proven to decrease companies’ time-to-process by up to 80 percent and reduce DSO by more than four days. Ginsberg’s Foods will leverage numerous modules on the ETran platform within its new suite of payment services, including ETran’s advanced RDC module to modernize existing check processing operations; ETran’s Fully-hosted Online Payment Portal to deliver customers convenient self-service online payment options with complete electronic invoice present and payment (EIPP) capabilities; ETran AutoPay to facilitate the automated initiation of ACH payments based on customers’ payment terms and outstanding invoices; and ETran Mobile to allow Ginsberg’s sales reps and drivers to securely accept check and ACH payments in the field across both iOS and Android devices. Ginsberg’s will also benefit from ETran’s unique ability to deliver true straight-through processing, eliminating manual cash application efforts through the automated delivery of remittance data to its back-office ERP/accounting systems. ETran’s cloud-based, highly-configurable design allows organizations to quickly tailor the platform to their unique business processes and workflows to accelerate accounts receivables operations across all payment methods and channels, from a single receivables processing platform. ETran’s agnostic, ‘plug-n-play’ nature works with existing banking and merchant processor relationships and supports efficient integration (batch or real-time) with any back-office system. All payment information is processed and stored on ETran’s fully compliant – PCI, HIPAA, SSAE 16 and more – Software as a Service (SaaS) platform. Ginsberg’s Foods has grown into one of the largest independently owned and operated foodservice distributors in the Hudson Valley since its humble beginnings as the local grocery store and butcher shop in Hudson, NY in 1909. Ginsberg’s over 260 team members believe in and share the philosophy of providing superior service with distinguishing standards from national competitors. Our corporate objective to provide our customers with excellent products and services, and act as a partner in their daily operation has afforded Ginsberg’s steady growth over for more than one hundred years. Learn more at http://www.ginsbergs.com. Financial Transmission Network, Inc. (FTNI) accelerates the way businesses accept, process, post and manage payments. Processing millions of transactions monthly, FTNI’s integrated receivables platform, ETran, accepts any payment method, via any payment channel — on a single, secure, cloud-based platform. ETran’s easy-to-deploy, modular design seamlessly integrates current business processes, bank and processor relationships, and back-office accounting software to deliver increased efficiencies and cost savings as a result of true straight through processing. Founded in 2007, FTNI serves more than 20,000 corporate users from leading organizations spanning numerous industries including Banking and Financial Services, Distribution, Insurance, Nonprofit, Property Management, Utilities, and more. For more information, visit http://www.ftni.com.